BEIJING, Nov. 2 (Xinhua) -- A senior Communist Party of China (CPC) official has called for better work from resident disciplinary supervisors. 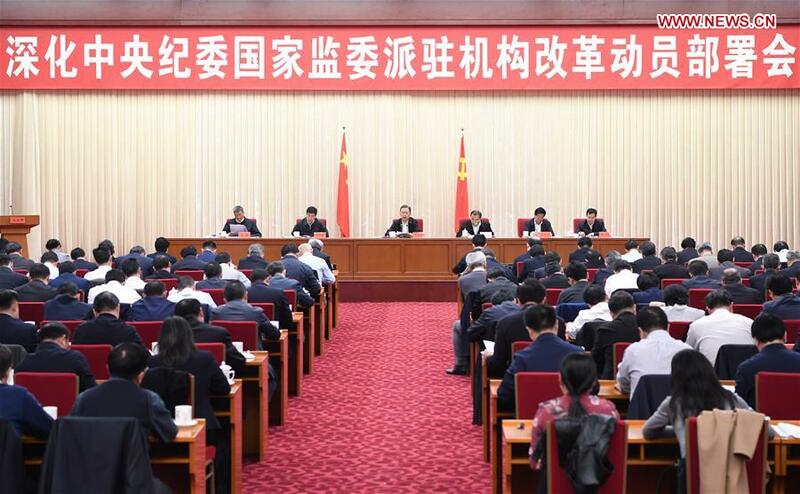 Zhao Leji, a member of the Standing Committee of the Political Bureau of the CPC Central Committee and head of the Central Commission for Discipline Inspection of the CPC, made the remarks at a televised work conference on supervision on Friday. It is a distinctive Chinese practice to have disciplinary supervisors stationed at various entities of public office, Zhao said. Resident supervisors must enhance political supervision to ensure the Party organizations under their watch fulfill their political responsibilities of governance, Zhao said. Supervisors should focus on leading officials and strengthen regular supervision as they have the advantage of being around, he added. Zhao urged supervisors sent to central Party and state entities to do better work while pledging that more supervisors will be sent to centrally-administrated financial companies. Oversight over centrally-administrated companies, Party chiefs and presidents of colleges and universities is also being strengthened, he said. Zhao requires resident supervisors be honest and clean and asked them to always maintain political integrity.